Is Someone "Borrowing" Your WiFi? There are many possible reasons why your wireless Internet connection suddenly slows to a crawl. An unauthorized user stealing your bandwidth is one of them. 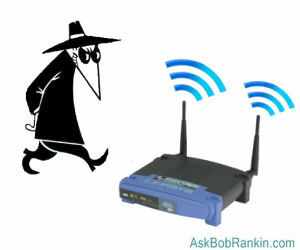 It is unlikely that such a bandwidth thief will access your WiFi network if you have implemented the basic WiFi security described in my article, Wireless Network Security Checklist. But it’s certainly a possibility that should be checked. Anyone with the skills and determination to hack your secured network is probably up to some sort of criminal activity. There are many casual, even “innocent” bandwidth thieves who see an available network and just assume it’s OK to “borrow” it. If they are challenged for a password when they attempt to log on, they'll probably just give up and move on to another target. If you haven't bothered to assign a wifi access password, the front door to your network is wide open. If you're not sure why that's a bad idea, see The WiFi Security Mistake You Must Avoid. A real cybercriminal is another matter. He is out to steal something of value from you or others. He may peruse computers on your network for identity and financial information he can use or sell. He may use your Internet connection to download files illegally or hack other networks, setting you up as the fall guy when the crime is traced back to your router. This sort of crook has the tools and skills needed to defeat most WiFi security measures, especially if you have a weak password. Windows and Apple computers have built-in utilities that show what devices are connected to your network. You can use these tools to look for unknown computers that should not be connecting to your network. Obviously, the first step is to know what devices are authorized. Each authorized computer should be assigned a computer name that you can recognize easily, i.e., "Jane PC" or "Billy Laptop". Other devices, such as printers, will have built-in names such as “HP Model 8610.” You should be familiar with what you own. In Windows 7 and 8, click the Start button and type “network” in the search box. Click on the word “Network” which should be the first item in the search results. On Windows 10, open Control Panel, then click "Network and Internet" then click the "view network computers" link. A multi-part display of connected devices will appear, listing computers, media devices, network infrastructure, and other items connected to your local network. “Computers” will include PCs and Macs. “Media devices” include printers, gaming consoles, smart TVs, and the like. “Network infrastructure” includes your Internet router and/or modem. "Other Devices" will include streaming video players, such as a Chromecast or Roku. For some reason, connected iPods, tablets and smartphones do not show up here. An unauthorized device will probably be among the “computers” listed, but if (for example) you see an Xbox that doesn’t belong to you, you obviously have an interloper. Apple OS X computers have a similar utility. You can access it via Finder > Go > Network. On a Linux computer, the nmap command will show connected devices. Your router’s configuration program provides a better view of ALL devices connected to your network. By logging into your router, you can see a list of devices that currently have IP addresses assigned to them. Consult your router’s documentation (or Google it) to learn how to access this list. Devices that may appear in this list include desktop and laptop computers, tablets and ebook readers, iPods, smartphones, wireless printers, streaming devices such as Roku or AppleTV, gaming consoles, and television set-top boxes. Many routers also store logs of past connections, which you can peruse to see what devices connected when you weren’t looking. If you don't know how to login to your router, or you don't know the password, ask your Internet Service Provider for help. If you discover an unauthorized user on a secured WiFi network, my advice would be to immediately change BOTH your router login password and your wifi access password (see my Wireless Network Security Checklist link above) and then restart your router. If the intruder re-appears, it’s time to contact your Internet Service Provider, or maybe even call the cops. None of the utilities described so far alerts you when an unauthorized device connects to your network. A free third-party utility called Who's On My Wifi for Windows or Mac does, though. Running in the background, it checks your router’s network connections list at intervals that you can set, typically every two minutes. Audible and popup alerts tell you when an “unknown computer (is) found.” You can mark a device “known” and it won’t trigger an alert again. Some advanced features (including blocking unwanted devices) and technical support are available with the paid "Who’s On My Wifi Online" service, but this is not required to use the free versions. Another option is Advanced IP Scanner. This is a free network scanning tool that checks your network connections and displays all connected devices. I found it much easier to use than Who's On My Wifi. Most recent comments on "Do You Have Wifi Intruders?" You wrote, "If I had written the article I might have put the first product into an obscure footnote at the very bottom of the page....or not at all." STEP 1: Disconnect the red wire. Moral: It pays to read all the way through first, as you so aptly pointed out. Thank you Bob for all your help. We all need some one that is willing to help us all. May God bless you and your family and keep you all safe. Thank you again for the awesome job you are doing. "On Windows 10, open Control Panel, then click "Network and Internet" then click the "view network computers" link." Thanks for the article Bob. The quoted statement above doesn't fit my version of Win10. At least I can't seem to find the "multi-part display of connected devices". Thanks Bob, especially your suggestion of "Advanced IP Scanner". On my W10 system the list only appeared in the folder "Network" in "File Explorer". None of the other suggested searches, (including "Network" itself) appeared when typed in the Start button on my W10 computer. Why are there so many ways to find this of which most don't work? Only MS knows. Also "Network" showed only my Printer and TiVo. "Advanced IP Scanner" showed all 11 devices (including my remote thermostat). It also has many other nice touches. A simple way to make it difficult for the simple Wi-Fi would-be sharer is to configure both router and Wi-Fi devices to use fixed IP addresses instead of DHCP, and limit the router's acceptable addresses to those you have defined for your devices. Softperfect wifi guard is another free program that identifies all connected. Softperfect Wi-Fi Guard is awesome and FREE!!! It scans your whole area and notes cell phones, tablets, DirecTV DVRs and Mini-Receivers and even your Wi-Fi Router! I have used this for a long time. The website says for Windows 8 and lower, but, I am using Windows 10 Pro 64 Bit and it does fine, just like it did when I was using Windows 7 Pro 64 Bit. I have set it up so that Wi-Fi Guard will scan at certain times of the day. When someone comes around and uses their cell phone or tablet - Wi-Fi Guard pops up to see if they are friend or foe. So, I do know what is going on with my Wi-Fi Router's usage. In the past - I did have someone "stealing from my Wi-Fi" and I was floored! I then called AT&T Tech Support on how to prevent. This is when I truly learned how to make my passwords long and secure. At the time, I could NOT believe how the Tech told me how to set my password. Those with Comcast really NEED to know if their Wi-Fi connection is truly secure. It really depends on your plan. Most of the cheaper plans have you sharing your Wi-Fi with others, that is if you have some of the fastest speeds. You pay extra to have a secure, private line.